Toru Odagiri = Born in 1975 in Chiba, Japan. After graduating from high school, he entered Tokyo Communication Art College (TCA). 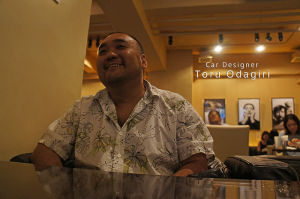 During his college, he participated to one year design training at RUOTE O・Z in Italy in 1996. Then, he joined Alfa Romeo’s University Stage as he was attending at Fiat’s Advanced Design in 1999. In 2000, he became the first Japanese designer to work at the design center of Alfa Romeo which called, Centro Stile. After engaging in numerous projects, in 2004 he was head hunted by a Japanese car manufacturer and returned to Japan.